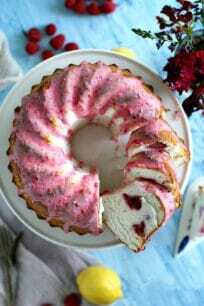 Raspberry Angel Food Cake is tender, airy and soft, with fresh raspberries and a refreshing raspberry lemon glaze. Spray a bundt pan (I used a silicone one) with cooking spray VERY, VERY light and set aside. Over a large bowl, sift together flour, ½ cup of the sugar and salt. Repeat the sifting process 3 times. Add the egg whites to the bowl of a stand mixer fitted with the whisk attachment and beat on medium speed until frothy, then add in the cream of tartar and vanilla bean seeds. Beat on medium-high speed until soft peaks form. Gradually add in the remaining sugar a few tablespoons at a time and beat until incorporated. Using a spatula, manually and slowly fold in the flour mixture in three additions by turning over the egg whites consistently until the flour is fully incorporated. Spoon half the batter into the prepared pan, evenly distribute the raspberries and top with the remaining batter, level off the top with a spatula. Bake the cake for 35 to 40 minutes, or until golden on top and spongy. Remove cake from oven, let it stand for 5 minutes then invert the cake on a cooling rack and allow it to cool completely. In a small bowl combine all the ingredients and mix until well combines, the mixture must be glossy with no lumps, with a thick consistency, but still pourable. If the mixture is too think add 1 teaspoon of lemon juice. Pour the mixture over the cooled cake and let it stand for 15 minutes for it to settle. *I usually make this cake with all purpose flour, as I rarely have cake flour on hand, and it works well. *Make sure the egg whites are at room temperature, this is very important for the cake. *Substitute with 1½ teaspoon vanilla extract if you don't have vanilla beans on hand.